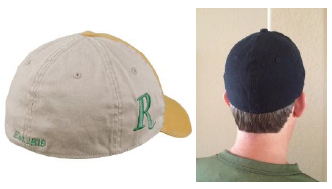 A baseball hat profile refers to the structure or crown on the front of the cap above the brim. 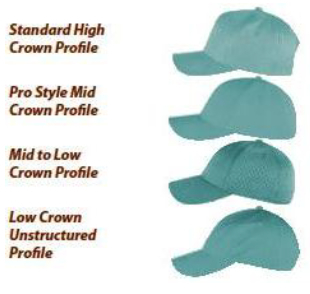 There are generally four types of baseball hat profiles: A) Structured – standard high Pro crown profile, B) Mid crown profile, C) Mid to Low crown profile, and D) Unstructured – low crown profile. Adjustable baseball caps have closures on the back of the caps that allow you to adjust the size. Types of closures include: A) Plastic snap, B) Adjustable hook/loop tape (a.k.a. 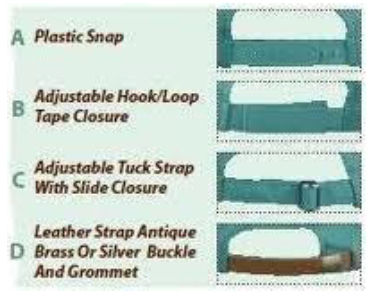 Velcro), C) Adjustable fabric tuck strap with slide closure, D) Leather strap Antique Brass or Silver Buckle and Grommet. The buckram of a baseball hat is the liner inside of the front of the cap that provides the structure and form. Structured caps have buckram and unstructured caps have no buckram, giving them the more casual, lower profile.